Firstly, in the afternoon session Mr Tau Morwe, Acting CEO of Transnet, a renowned state-owned enterprise spoke to a packed audience about the fate and future of this organisation which manages multi-billion-Rand projects. 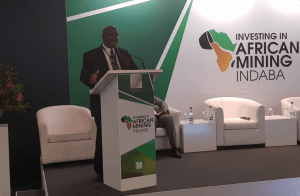 Opening his speech, Mr Morwe mentioned the value held in the current projects and investments in manganese and other mineral ores. He then went to single-out infrastructure development as a priority and a prerequisite for responsible operations. Transnet is involved in projects that seek to develop the ports in South Africa. Transnet is working in partnership with DeBeers, this should be commended, he stated. Their work in handling heavy freight, though at times challenging, is progressing smoothly. It goes without saying that Transnet has had several challenges in the past to overcome, challenges they continue to face, but that is the nature of business. For example “For over 10 years our investment in coal mines didn’t yield economic benefits but because we were patient we now have around 6% growth in the business”. Corruption is another problem which must be addressed, and Transnet see handling corruption as one of their top business operations. Morwe continued: “Our projects must be fulfilled. We need to deliver to benefit the people of this country. One way to handle this is to embrace our operational model that is fit for purpose. This is really what we must embrace going forward”. Mr Morwe also displayed the Transnet action plan to the audience showing that as a company they want to satisfy the needs and demands of their customers, wherever they are. Secondly, another panel discussion took place in the same venue. Straight to the point, the moderator reminded the crowd “The minister said mining isn’t about the rock, but the people. I want to add that mining isn’t about the machinery either”. Panellists represented many different companies, but members of workers unions were also present. A discussion around the digital impact in mining was riveting, one of the key advantages being that “automation helps with efficiency”. It was stated that while people will remain at the core of Exxaro, they must ensure that they play a key role in operational efficiency of the company in the future. The trade unionist, Joseph Matunjwa from AMCU, said “We want our children in South Africa to be trained as innovators… our people must just be operators of machines, they need to be taught to be innovators. For that we need to change the education system”. Another panellist demonstrated the usefulness of robotics technology. She said “Robotics helps us to unleash human creativity. As much as we need artificial intelligence, we also need as human ingenuity”. This viewpoint prompted some people to walk out of the venue, hopefully not investors! Fortunately, the debate on digital technology and robotics was sufficiently interesting to keep the majority of the audience engaged until the session was finished.